Ardbeg, the iconic Islay malt whisky unveils its third edition of Supernova 2014, a new expression of Ardbeg’s peatiest Single Malt. 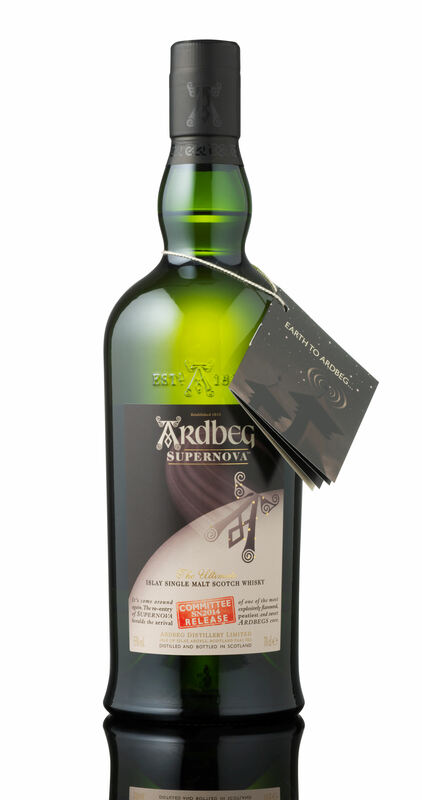 The launch of Supernova 2014 coincides with the return of Ardbeg’s pioneering Space experiment. To celebrate this ground-breaking journey, the distillery will release the Single Malt fittingly named after a super bright explosion of a star. A vial of Ardbeg spirit has been orbiting the globe in the International Space Station for the last three years in a mission to decipher the impact gravity has on maturation. The vial will re-enter the earth’s atmosphere on 12th September, travelling back in the Soyuz-U Rocket and will land in Kazakhstan. The sample will then be taken to Houston, Texas to be reunited with the test sample from Ardbeg’s warehouse #3 to begin the analysis in the first study of its kind. Previous editions of Supernova have been described as “out of this world” and Supernova 2014 looks set to follow this form. It is bottled at 55% ABV, and will be available from 12th September 2014 from Ardbeg Embassies* and on Moët Hennessy Selection with a RSP of £124.99. Intense zestiness of smoked lemons and pears, lemongrass and pine needles, embedded in a deep, resinuous, sticky waxy base. Distinctively peppery, spicy and electric. Powerful peppermint, antiseptic lozenges and other familiar, medicinal tones. Dark, dark birch tar intermingles with spicy-sweet chilli flavoured chocolate, while the entire mouth and palate are coated in luscious linseed oil. Rich flavours of tar, creosote, briar wood, spicy tobacco and liquorice root. Per ora speriamo solo di poterlo avere poi …commenteremo!